Know that help is a phone call away with a medical alert device. Do you have an elderly parent that spends a great deal of time home alone? Unfortunately, it’s not uncommon for senior citizens to experience feelings of isolation and loneliness. As people age, they face a number of unpleasant issues, such as vision and hearing loss, a loss of the ability to drive, and physical aches and pains. Even worse, they may experience the deaths of those close to them, such as spouses, siblings, and friends. 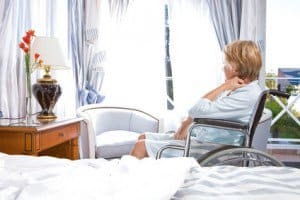 At this point in the life of an elderly parent, when they are experiencing so much loss, they may be less willing to leave the house much, even if social opportunities do present themselves. However, to stay mentally healthy and vital, they truly need to have connections with family members and peers. The following are suggestions for helping your elderly parent combat loneliness. 1) Keep frequent phone contact. It may feel like overkill at first, but you should begin to call your parents more regularly than you did in your younger years. Calling every day just to say hello is not out of the question; you never know when a particular date on the calendar may trigger a sad memory for them and they will need someone to talk to. 2) Make in person visits regularly. It is very important for you to see your parent’s living environment on a regular basis. First, these visits will allow you to check for any safety hazards in the home. Next, their surroundings can offer some important clues as to how they are feeling. If your normally neat and clean parent stops picking up after themselves, or you notice they are starting to draw the blinds and keep the rooms darker than before, it can be an indication that they are feeling depressed or withdrawn. If you live at a distance and are not able to visit frequently, provide your relative with the ability to participate in video chat with you. Another option is to hire a caregiver to check in regularly with your parent. 3) Find reasons to get your aging parent out of the house. Take them places you know that have always enjoyed, such as to the movies or to a comedy show. You should also check out any community resources for senior citizens where your parent lives. There may be a nearby senior center where your loved one can make new friends and enjoy a social game of cards or bingo.